I GET slightly apprehensive whenever I go to a fine dining restaurant, especially when I’ve heard mixed reports. So was the case with Adelaide’s Enoteca – some people told me it was good, others said it was overrated. 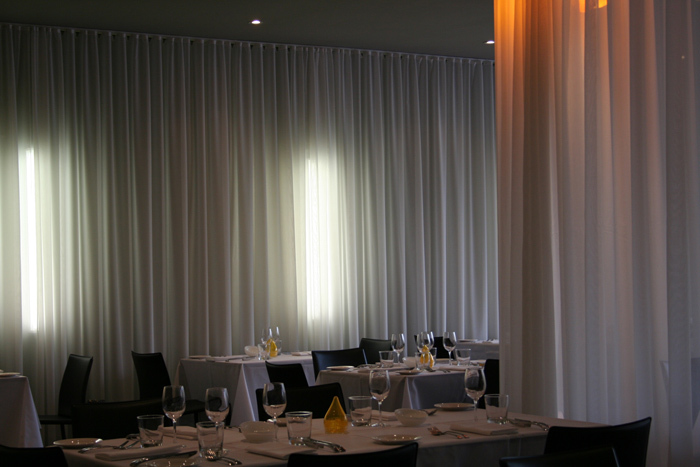 Enoteca is housed in the South Australian Italian Club on Carrington Street in the south-east corner of the city. When I was much, much younger my parents took my brother and me to the Italian Club on an almost weekly basis for dinner where endless courses of antipasti, pasta, scaloppini and deserts appeared in front of my wide-eyed face. Back then dining at the Italian Club was more like being a guest at an Italian wedding banquet than a restaurant (and yes, I did learn the infamous “chicken dance” there). I also believe that my “Anglo” parents were also up to mischief by encouraging my brother and me to dance with the Italian girls there (my father’s obsession for Italian cooking would be given a boost if there was an Italian daughter-in-law in the family). Enoteca is way, way different than my 1970s experiences. Flashbacks of images of ageing Italian men and women drinking home-made red wine out of tumblers and dancing on gaudy industrial-strength carpet with rabid children (like myself) running in between them (and away from cute Italian girls), disappeared when I entered Enoteca’s stylish and softly-illuminated interior. It is open (somewhat stark), yet chic. A bar is to one side of the space and is the feature of the room. The tables are neatly dressed with white-linen tablecloths and tea candles and are positioned around the rest of the space (and have enough distance from other tables so that you aren’t dining on top of other guests) and you sit on high-back leather chairs. Low lighting and long pale tulle drapes soften the “starkness”. In the middle of the room is a table which is surrounded on three sides by a tulle curtain and that is where me and my guests dined. This table is excellent – it is like having your own little private dining room – in front of you is the bar and on the sides and behind you are other guests. You have privacy without missing out on the action in the rest of the restaurant. Waiting staff, smartly dressed in pressed black uniforms, are professional and enthusiastic about the food and the wine on offer (especially apparent from our waiter for the evening – Nathaniel). Service was attentive but unobtrusive. The menu proudly promotes the use of specific South Australian-sourced produce (and the odd interstate visitor). The al-la-carte menu includes: quagila al burro (butter poached quail with cauliflower puree, crisp pancetta, cauliflowerettes and hazelnut vinaigrette); risotto al anatra (ferron vialone nano rice with braised duck leg, hazelnuts, ruby chard and red onion); pappardelle coniglio (pappardelle with braised wild rabbit, seasonal vegetables and sage butter sauce) and pancia di maiale al forno in agrodolce (roasted pork belly, fried eggplant, black cabbage and sweet sour sauce). 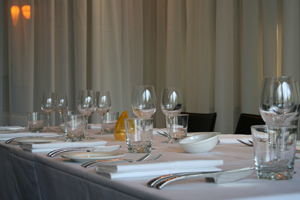 Diners can order from the al-la-carte menu or go for a choice of degustation menus (one with selected wine for each course). The four of us decided to have the degustation menu – six courses for $100 per head ($75 for four courses), and chose our own wine. Being winter the degustation selection offered some appetising rustic courses. To kick things off, Nathaniel delivered some McLaren Vale Coriole olives and virgin olive oil to accompany the bread while waiting for the main event to begin. The first course was a carpaccio of Port Lincoln Kingfish. 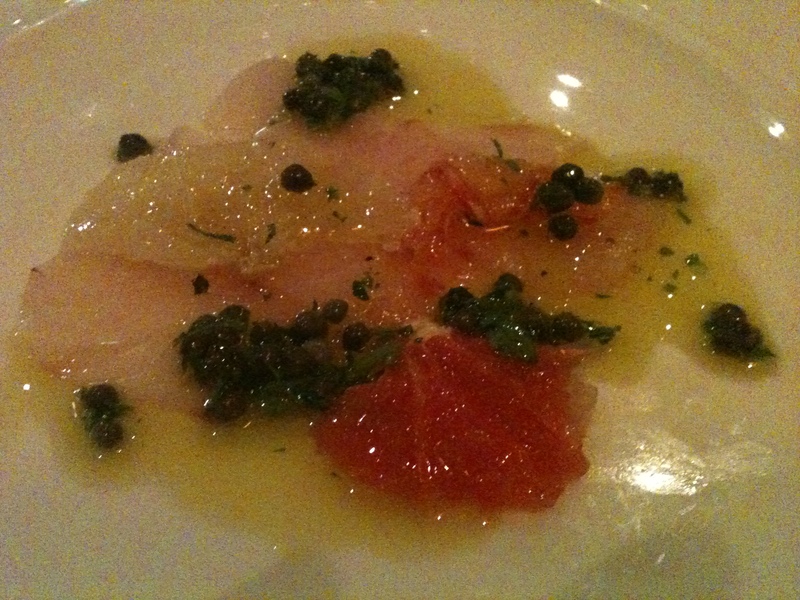 The translucent slices of kingfish were topped with finely chopped parsley, baby capers, sea salt, and slices of grapefruit and blood orange and drizzled with Coriole virgin olive oil. An amazing array of flavours (salty, tart and tangy) danced on the tongue. It was an impressive fresh and light dish and set the scene for the quality of the courses to come. 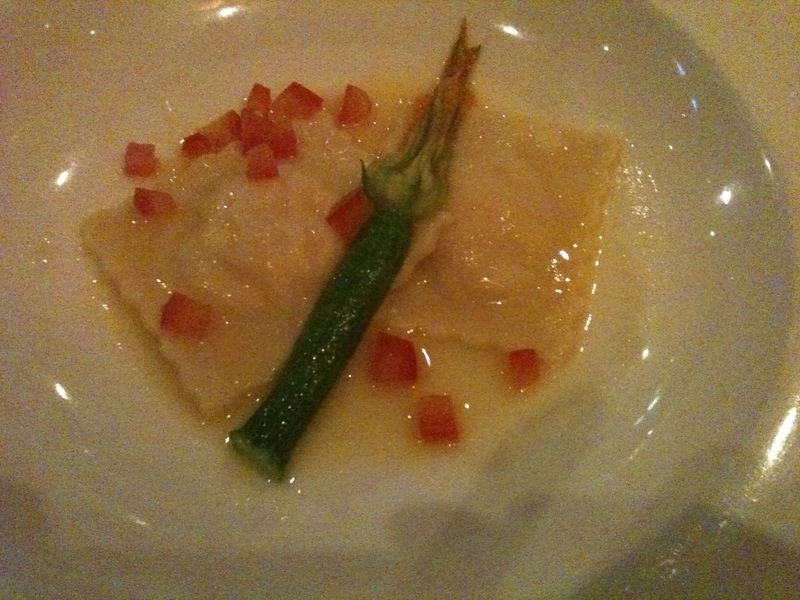 Next was the scallop and prawn ravioli. On our plates were two ample and perfectly cooked (al dente, of course), pillows of ravioli stuffed with fresh minced scallop and prawn resting in a thin fragrant and tangy puddle of saffron and citrus sauce. Occasionally scattered finely-diced morsels of fresh tomato added a wonderful acidity and freshness to the whole dish. To top it off was a wonderfully steamed zuchinni flower placed across the two pillows. Just superb. 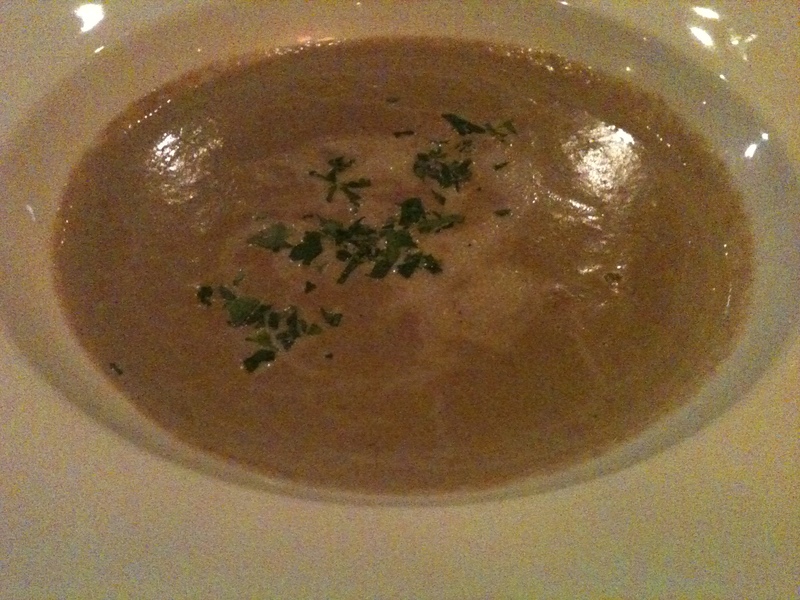 Out came the third course – a mushroom, chestnut and truffled pecorino soup. We all got a hefty waft of the soup as it approached. The soup was smooth with a rich texture, a pleasing mocha colour and was full of body with upfront earthy mushroom and truffle flavours. The fat of the cheese forced the flavours to cover the whole mouth and last, and last, and last. Great richness, excellent combination of flavours and well balanced – we wanted more. 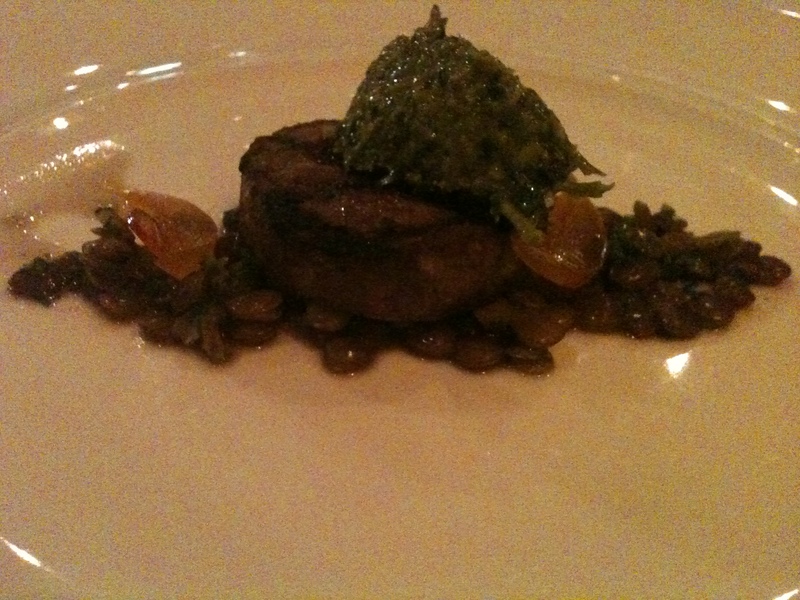 Not long afterwards the cotechino sausage topped with salsa verde on a bed of black lentils with translucent mustard fruits arrived. The char-grilled Italian sausage was rich and spicy and the lentls were superbly cooked in stock making it a heavy, rustic monster of a dish. The sweet mustard fruits helped cut through the heavy char of the sausage. Being winter it was a well chosen menu item. Nathaniel informed us that the sausage was made at Entotecca. We were beginning to suffer palate fatigue from the barrage of big flavours when, just in the nick of time, Nathaniel brought out rhubarb sorbets – wonderful, frosty little bombs that exploded on our tongues, cleansing and revitalising, and readying us for more. 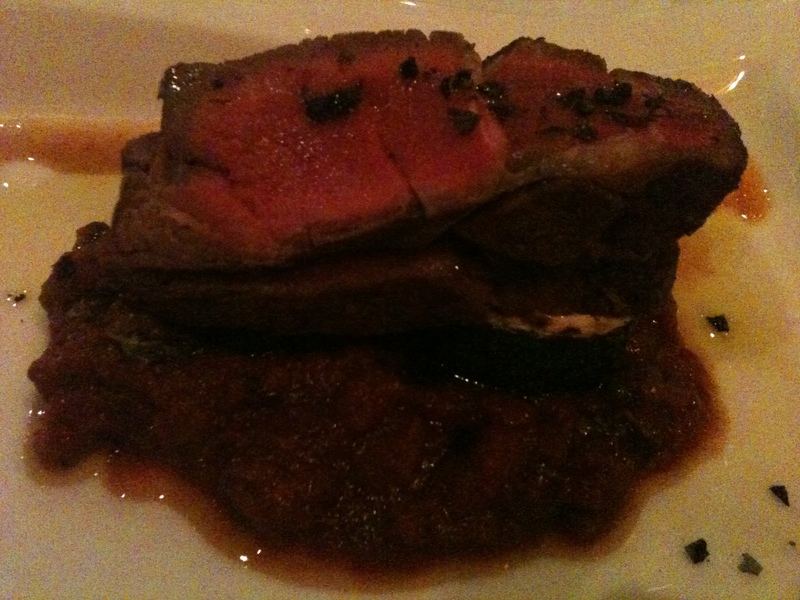 If there was to be a ‘main course’ then the Scotch fillet with a pizzaiola sauce that followed would be it. To the centre of the plate was a stack of slices of medium-cooked Scotch fillet topped with grilled zucchini and dressed with a rich, sweet tomato sauce with chunky black olives and salty capers. The meat was tender and moist and the slow-cooked rustic-inspired sauce brought back memories of good ol’ Italian home-style cooking. I admit I was sceptical seeing a “pizzaiola sauce” on the menu but why not, especially when you use top ingredients and have pride in what you deliver (and we were in the “Italian Club” after all). The steaks were accompanied by a salad with refreshing sliced fennel, lettuce and cucumber dressed with white balsamic vinegar and Coriole virgin olive oil. Last but not least, the four of us shared a plate of zeppole – fluffy little donut balls filled with apple, tossed in cinnamon and served with a rhubarb coulis and double cream and neatly sitting on a slice of panforte. The donuts were delicious but the cheese plate that followed them was sublime. The highlight was the Bianco Sottobosco (an Alba black truffle-infused cow and goat’s milk cheese from Italy’s Piemonte region). The blu del Monviso (a creamy blue from the Po Valley), and the taleggio (a semi-soft wash rind cheese from Valtaleggio) came a close second. We left Enoteca and ventured into the crisp winter air with smiles all round and with renewed confidence in Adelaide’s fine dining scene. Enoteca proved the sceptics wrong on this night and I finally got to the chance to behave myself (well, almost) in the Italian Club. The verdict: Traditional Italian fare with some surprising and intelligent contemporary twists. A clever and unashamedly paraochial use of local South Australian produce. Service was excellent, polite and unobtrusive. Good value for a fine dining restaurant. Ate there: 3 July 2010. Thank you to one of my dining companions, dear friend and fellow bon vivant, Corey (who hasn’t yet escaped Adelaide and can be seen lurking around Adelaide Central Market and various noodle restaurants reading comics on his iPad), for his contribution to this review. He, too, is sceptical of the sceptics. 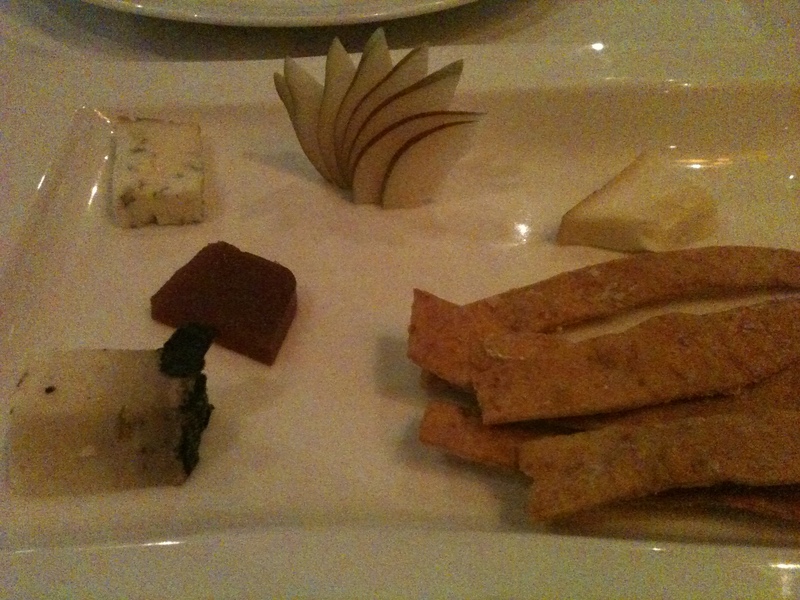 This entry was posted in Adelaide, Italian, South Australia and tagged Adelaide, Enoteca, Food, Italian, South Australia. Bookmark the permalink. It was certainly a great feast and the wine wasn’t bad either (you didn’t mention that), and how about that curtain! You probably were too young to notice the long table of elderly men just inside the restaurant which many people visited to pay their respects every Friday night before going on to dinner. Thanks for another tasty read HBV. 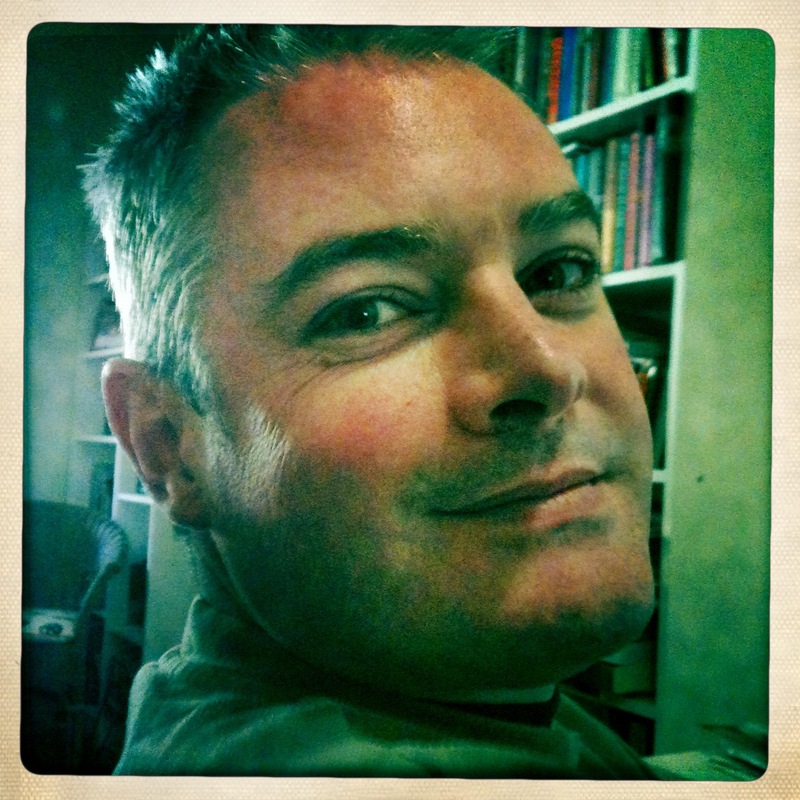 I can taste it now, but alas not likely to visit the IC in Adelaide any time soon… Looking fwd to your next Syd feed blog. Long live the President of the CNDC!